Sunflower (Helianthus annuus L.) is primarily an oil crop (see the main Sunflower datasheet) but the plant itself and its crop residues (heads and leftover stalks) are a popular roughage for livestock and have been used for this purpose since the early 20th century (Gaines et al., 1925; Ray, 1919). Sunflower as an alternative forage can be a valuable option under drought conditions, which hamper seed production potential, or where there is a shortage of roughage (Garcia, 2006; Goncalves et al., 1999). Sunflower forage is usually fed as silage. The threshed heads of sunflower are a valuable feed, provided that they have been dried before threshing (this depends on the climate) (Suttie, 2000). The dry heads can be made into a meal (Göhl, 1982) or mixed with other residues of sunflower harvest and oil extraction to make sunflower screenings (Lardy et al., 2009). The stems are a poor feed and are usually either ploughed in or used as fuel (Suttie, 2000). The name sunflower is sometimes incorrectly used for other Asteraceae species with large yellow flowers, notably the Jerusalem artichoke (Helianthus tuberosus) and the Mexican sunflower (Tithonia diversifolia). Native to Central North America, sunflower is cultivated worldwide, from Russia to South America. Sunflower can be grown between 40°S and 55°N, but the highest production occurs between 20-50°N and 20-40°S. It can be grown up to an altitude of 2600 m in the tropics, but grows best below 1500 m. It needs dry sunny weather and deep soils able to supply much water. It can stand temperature fluctuations between night and day ranging from 8°C to 34°C. It is moderately drought-tolerant (Ecocrop, 2011). Sunflower needs contrasting seasons to thrive (a thermal gap between summer and winter, a circulation of winds conveying rain, and short periods of frost) (Grompone, 2005). It does not grow well in hot and humid climates. In Africa, its cultivation cannot expand beyond the highlands of eastern and southern tropical Africa (van der Vossen et al., 2007). Sunflower can replace maize as a summer crop or can be sown in places where maize cultivation is difficult (Romero et al., 2009; Mangado Urdaniz et al., 2005). The ideal DM content for ensiling sunflowers is between 30 and 40%. Sunflower forage harvested with less than 30% DM can cause undesirable fermentation and excessive effluent seepage from the silo. Sunflower stalks can contain high amounts of water and the dried appearance of the leaves may be misleading: even when the seed is mature, the whole plant can contain 80% water (Kuhl et al., 1998). Therefore, it may be necessary to wilt the plant down to 30-40% DM before ensiling (Lardy, 2009). Another way to dry sunflower plants is to let them be killed by frost and wait up to 2 or 3 weeks before chopping and ensiling (Garcia, 2006). 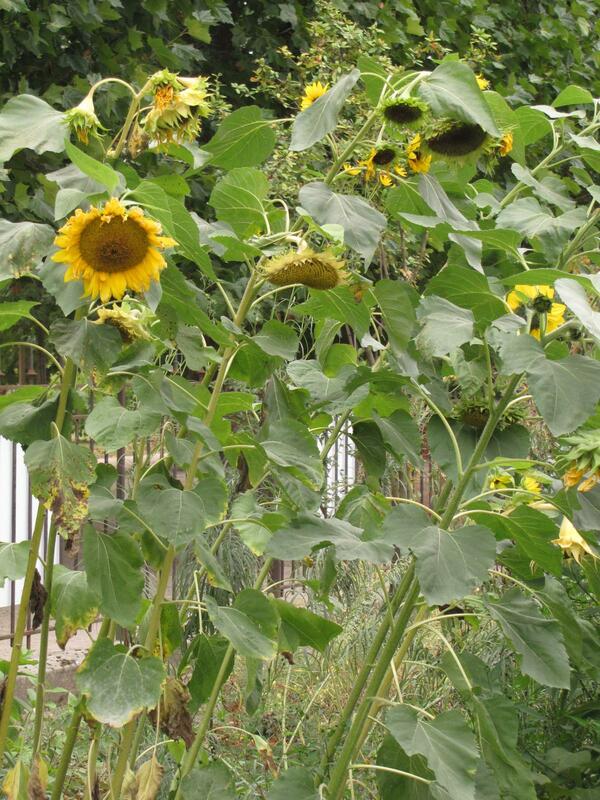 Wilted sunflower plants can be ensiled alone or in a mixture with dry feeds such as maize or sorghum (Demiirel et al., 2006; Valdez et al., 1988; Hubbel et al., 1985; Lardy, 2009). Sunflower silage has an important buffering effect but it is easily ensiled and final pH is low, about 3.8-4.1 (Brunschwig, 2003). Adding urea, dried whey or NaOH can improve silage quality (Schingoethe et al., 1980). Deseeded heads with high moisture content can be ensiled with or without molasses (Göhl, 1982). Sunflower heads can be shredded, well dried (preferably in a grass drier), and reduced to meal in a hammer-mill (Göhl, 1982). Sunflower is a fast-growing crop with high forage yield capacity. In Cuba, fresh matter yields are 45-75 t/ha in 60-70 days in dry conditions, and up to 90 t/ha in Brazil (Penichet Cortiza et al., 2008; Goncalves et al., 1999). Animals can graze sunflower but waste a lot of forage when they enter the field. For that reason, ensiling is generally preferable. The best harvest time for ensiling sunflower is highly variable, depending on climatic conditions and sunflower genotypes (Toruk et al., 2010; Goncalves et al., 1999). Recommended stages vary between between 25% flowers blooming and the final flowering stage (Tan et al., 1996 cited by Demiirel et al., 2006). Half the flower area filled with immature seeds can be a signal for harvest (Myers et al., 1993). In Nebraska, sunflower intended for silage can be sown as late as July and be used in double-cropping systems after the wheat harvest (Anderson, 2010). After the flowering stage has passed, crude protein level declines and lignin content greatly increases (Myers et al., 1993). Once sunflower has been harvested for silage, livestock can enter the field and graze on the leftover stalks (Lardy, 2009). Sunflower forage (fresh or ensiled) is generally richer in protein (7-16% DM) than maize silage. Its NDF content is similar to that of maize silage (about 40% DM) but its ADF and lignin content are higher (35 and 11% DM for sunflower vs. 24 and 3% DM for maize respectively), resulting in a lower nutritive value (Peiretti et al., 2010). Sunflower silage can also contain much more fat than maize silage, alfalfa haylage or other common forage crops, depending on the variety and stage of maturity. Silage made from oil seed varieties may contain up to 10-12% fat while silage made from non-oil seed sunflowers or low yielding crops usually contain only slightly more fat than maize silage (3-4% DM) (Kuhl et al., 1998). Due to their higher seed content, sunflower silage made from mature plants tends to be higher in fat than silage made from immature ones, which contain less seeds (Lardy, 2009). After the flowering stage, the protein content decreases and the lignin content increases (Peiretti et al., 2010). Sunflower stalks, heads (without seeds), and mixtures of stalks and heads are generally low-protein, fibrous materials with a highly variable composition due to differences in maturity and in the proportions of residues. Nitrate accumulation has been recorded in sunflower plants that had grown during drought (Lardy, 2009). Care should be taken that no forbidden pesticide has been sprayed on the sunflower plants before harvesting (Garcia, 2006). Sunflower forage is usually fed as silage to ruminants. Due to its high fibre (particularly lignin) content, it is less digestible than maize silage. However, this lower digestibility is somewhat offset by the higher oil content, and the energy value of sunflower silage is only about 5-20% lower than maize silage depending on the variety and stage of maturity at the time of harvest (Kuhl et al., 1998). Numerous experiments with ruminants, mostly in the United States, Brazil and Eastern Europe, tend to indicate that sunflower silage is a valuable forage that can partly substitute for maize silage. Whole substitution generally results in lower dairy production or growth rates, though this is not always the case due to the high variability of both maize and sunflower silage. Partial replacement of maize silage with sunflower silage is considered to be a viable option for lactating cows of moderate milk production (Garcia, 2006). In the United States, cows fed sunflower silage (high-oil variety) in substitution for maize silage had a decreased milk production (by 8%) but milk fat was 12% higher (McGuffey et al., 1980). In another experiment, the substitution of maize silage with up to 66% sunflower silage did not affect milk and protein yields in cows producing 27 kg milk/d (Garcia, 2006). A similar effect was observed in Brazil: full substitution of maize silage by sunflower silage in dairy cows (25 kg milk/d) resulted in lower yields of milk, milk protein and total milk solids, but yields were not affected by partial replacement up to 66% (Silva et al., 2004). In Russia, another experiment also noted that full replacement of maize silage gave a lower performance, but that partial replacement was satisfactory (Grigorova et al., 1988). However, total substitution of maize silage by sunflower silage can be beneficial to dairy performance (including milk production and milk quality) in certain circumstances, for example when maize quality is erratic (Hubbel et al., 1985). Dairy heifers fed sunflower silage harvested 2 weeks after flowering had a similar daily gain to heifers fed maize silage (790 g/d vs. 750 g/d) (Harper et al., 1981). In Brazil, with feedlot steers fed a 40:60 concentrate:forage diet, where sunflower silage substituted for up to 66% (DM) of the maize silage, the sunflower reduced rumen fermentation of DM and NDF (Freitas et al., 2010). An earlier experiment in Poland found that bullocks fed sunflower silage had lower daily gains than animals fed maize silage, though the difference was not significant (121 vs. 146 g/d) (Gonet et al., 1979). Intake of sunflower silage may be a problem due to the high fat and high fibre content, and it may be necessary to limit sunflower silage to less than 50% or less of the total forage in the ration (Kuhl et al., 1998). In Brazil, sunflower silage fed ad libitum to fattening lambs in diets containing 30 to 60% concentrate gave a lower performance than maize silage, including DM intake, feed efficiency and daily gain (108 vs. 180 g/d). Lambs fed sunflower silage needed more concentrate in the diet to obtain a performance similar to those fed maize silage (Bueno et al., 2004). Other experiments have been more positive. In fattening lambs given 300 g concentrate and sunflower or maize silage ad libitum, no significant differences were observed between the two treatments in terms of daily gain, carcass composition (except for fat cover which was higher in lambs fed sunflower silage) and feed conversion (Sousa et al., 2008). Dry matter intake was found to be similar for lambs fed maize or sunflower silage (62-63 g/kg W0.75) (Mizubuti et al., 2002). In a comparison of different varieties, Brazilian sunflower silages were classified as suitable roughages because the DM intake was higher (63.6 to 74.5 g/kg W0.75) than local recommendations for maintenance (Ko et al., 2005). Sunflower crop residues can replace fibrous by-products such as straw, or low nutritive value forages up to 50% of the diet for dairy or growing ruminants. 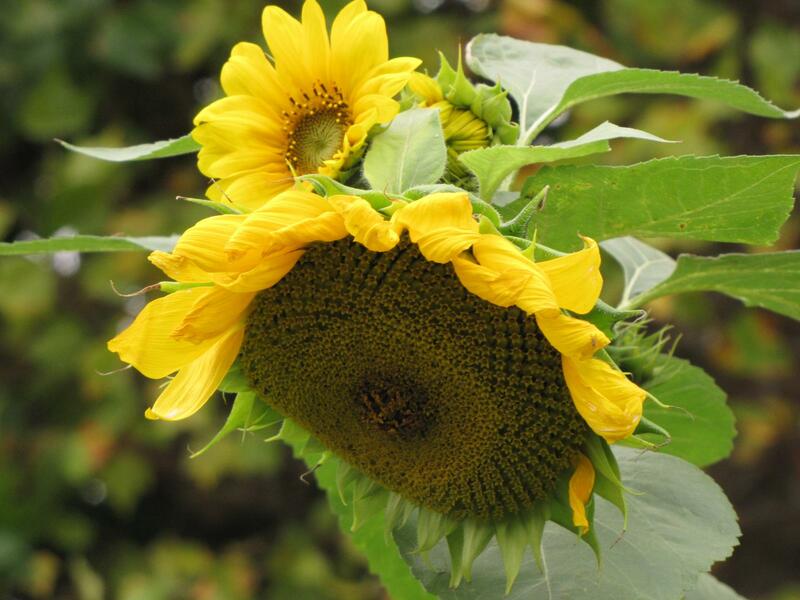 Sunflower heads can be a valuable substitute for conventional roughages in a complete diet where roughage is included at up to 60% (Anandan et al., 2002). Depending on the proportion and nature of the plant material, the nutritive value of sunflower crop residues can range from low to relatively good. For instance the only OM digestibility value reported on deseeded sunflower heads is 63% (Alibes et al., 1990; Rogerson, 1956), while a much lower value (46%) has been reported for the whole stover (stalks and heads) (Saricicek et al., 1997). Leftover stalks have been described as palatable (Lardy, 2009). Because of their high fibre and low protein content, sunflower crop residues must be supplemented with ingredients rich in energy (cereal grains, milling by-products, feeds containing digestible fibre, molasses) and protein (oil meals or local protein-rich by-products). Mineral supplementation must also be provided if long term performance (growth or milk production) is expected. Sunflower stalks and sunflower heads were included at 15% and 20% respectively in complete diets fed to crossbred dairy cows producing 3.5 kg/d of milk with no differences in DM intake compared to the control diet (concentrate and maize stover). 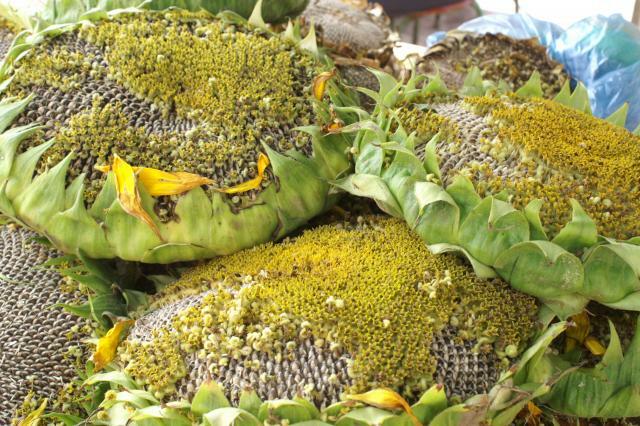 The digestibility of OM, protein and lignin from sunflower heads was higher than from the stalks and control diets. Dairy performance was also higher (daily milk yield +15%; fat +20%; solids-not-fat +16%) (Rao et al., 1999). Low-yielding dairy cows (less than 10 kg/d milk) at grazing, and receiving a concentrate containing 40% sunflower heads, gave similar daily milk yields and milk fat but lower milk protein than the control diet (Ngongoni et al., 2009). Sunflower heads, pelleted with an expander-extruder, and included at 40% in a concentrate could be used as a cost-effective source of roughage in dairy rations. In cows fed pelleted sunflower heads, nutrient digestibility and daily milk yield were higher than for the conventional diet with no effect on milk composition. The DM and nutrient intakes were lower but still above requirements (Nagalakshmi et al., 2006). In a later experiment with pelleted sunflower heads (included at 40 or 50%) fed to buffaloes, DM intake for the 40% sunflower head diets was similar to that obtained with the conventional diet (77.5 vs. 83.6 g/kg W0.75) but the 50% diet gave a lower intake (71.3 g/kg W0.75) (Nagalakshmi et al., 2007). Sunflower heads were used in complete diets for dairy buffaloes in place of a traditional diet based on rice straw, rice bran and wheat bran, resulting in higher milk yield but lower DMI and unchanged milk fat and milk solids-not-fat contents (Anandan et al., 2004). Sunflower stalks and heads were included at up to 32% in a dairy heifer diet based on alfalfa hay, maize silage and a concentrate mix. There was no significant effect on rumen ammonia and volatile fatty acids, but DM digestibility and daily weight gain (980 vs. 1310 g/d) decreased with increased sunflower residue in the ration (Drackley et al., 1985). Sunflower stalks were included in diets for crossbred bulls but nutrient digestibility was better when they were supplemented with groundnut haulms (Rao et al., 1997a). Likewise, urea-treated sunflower stalks were well consumed by crossbred cattle and nutrient digestibility increased when they were supplemented with concentrate (1.5 kg/d) and mulberry hay (Rao et al., 1997b). Sunflower stalks and sunflower heads were included in complete diets for sheep at 50% (Punj, 1988). Several experiments including stalk, heads or mixtures of both in complete diets for small ruminants show that the nutrient digestibility was equal or higher than that obtained with control diets based on cereal straws or grass hay (Reddy et al., 1994a). Sunflower stalk and heads were included at up to 20% of the diet for growing sheep and goats, resulting in a similar DM intake (1100-1200 g/d) and DM digestibility (59-60%) and in a better daily weight gain (175 vs. 154 g/d) than from soybean crop residues. Higher levels (30-40%) of sunflower crop residues tended to decrease DM intake and growth but not significantly (Rasool et al., 1998). In rams and goats, a mash of sunflower stalks and heads included in a total mixed diet gave lower DM, protein and crude fibre digestibility than maize stalks (Reddy et al., 1994b). In growing goats, dry, ground sunflower heads without seeds could be introduced at 46% in a total mixed diet. This diet offered ad libitum for 90 days resulted in a daily gain of 84 g/d with a DM intake of 890 g/d (Aregheore, 2001). Urea and alkali treatments have been tested on sunflower crop residues in the hope of improving their nutritive value, with limited results. Urea treatment (4%) of stalks (Rao et al., 1997a) or stalks and heads (Saricicek et al., 1997) increased the digestibility of DM, protein and NDF in bulls (Rao et al., 1997a), and of DM, OM and crude fibre in rams (36 vs. 43%, 46 vs. 48% and 43 vs. 47% respectively). However, when compared to untreated roughage, urea treatment had no effect on daily gain (108 vs. 100 g/d), DM intake of roughage (550 vs. 554 g/d) and DM intake of concentrate (592 vs. 599 g/d) respectively (Saricicek et al., 1997). NaOH treatment (4%) of stalks improved the digestibility of the stalks (OM digestibility 71%) in goats and DM intake was 36.6 g/kg W0.75. However, the in vivo nitrogen balance was negative and NaOH-treated sunflower stalks fed alone could not meet protein requirements (Boza et al., 1987). Fresh sunflower leaves are very palatable for rabbits (Harris et al., 1983). They can be recommended for pet rabbits as an easy-to-use fibre source to improve their dental status by stimulation of chewing (Harcourt-Brown, 2009). Sunflower leaves cannot be recommended for commercial rabbit diets. In a 28-day trial, dried sunflower leaves included at 40% of the diet were highly detrimental to rabbit growth (16 g/d vs. 40 g/d for the control). While no mortality or digestive disorders were observed, the rabbits fed sunflower leaves suffered significant hair loss by the end of the experiment. Both the poor growth rate and hair loss could have been caused by the presence of chlorogenic acid in the leaves, which may have resulted in a reduction of protein availability, and hence a protein deficiency (Harris et al., 1981). Such an alteration of protein digestibility associated to chlorogenic acid has been demonstrated in rats (Hsu et al., 2006). Sunflower nectar and pollen are very attractive for bees but have low nutritive value (RIRDC, 2011). Unlike other honey plants, sunflower pollen is poor in protein (15%) and poorly digestible in the bee midgut (Human et al., 2007). Because some insecticides can endanger bee populations, it is recommended to spray sunflower fields in the evening, when bees are in the hive (RIRDC, 2011).